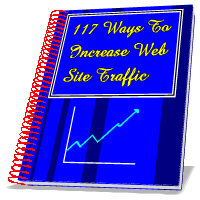 This is an eBook that describes various methods of promoting your web site. You can download copies of the eBook for your own use. Permission is available to redistribute the eBook to others, for example, to your customers or to your opt-in mail list. Before redistributing you may rebrand the eBook, to insert a link (on pretty much every page) to your business, and also so that the links within the eBook to Answers 2000's products, are coded with your affiliate id (which allows you to earn a commission if your customer buys a product through the link).